6"x6" oil on primed masonite artboard. Héé have you being painting in "De Betuwe"
It's such a Dutch scene, unbelievable. I'm smiling at this scene & comment - it must be a universally wonderful thing to stand in an orchard of trees heavy with fruit - this is one of my favorite views, too. 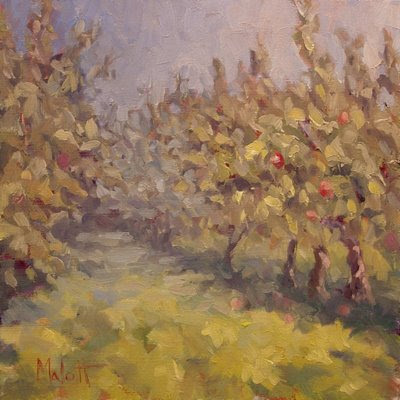 I painted one of my favorite apple places today, then noticed your apple scene - what a beautiful depth of field...& a sense of being there! delightful!